With a millennial family reunion planned for 2000, I transferred Sheila's work so it was stored in a readily accessible database. Some gaps have been filled using Internet sources. Much of this research was published on these webpages in January 2000 so that it might be accessed by anyone interested in it. More information in the form of dates, facts or photographs have been added and now form the basis of a booklet on the family history. For privacy reasons, information on living persons is limited. The first Fairlambs were certainly in Allendale by 1600. The first documented birth was at High Oustley in Allendale in 1630, and church records go no further back. Fairlambs were farming at Bishopside and Old Town as tenant farmers prior to 1640, and information about the deed of sale dating from 1650 can be viewed on the documents page. Fairlambs were still farming at Bishopside in 1730, although others were farming at Moorhouses closer to the village. In those days several families might farm on the same holding, particularly as farming income was often supplementary to mining or other occupations. George and John Fairlamb had an aunt, for example, already living at Moorhouses in 1680. In the summer of 1999, Valeria Dunn (née Fairlamb) combated sheep and failing light to see what remains of Moorhouses. Once again it is a farm that fell into disrepair in the twentieth century. By 1750 the grandson of the last Fairlamb positively known to have lived at Bishopside was resident at Scotch Hall. His son Nicholas (17731852) was the break between a farming heritage and the village-based life of subsequent generations. Nicholas (b.1773) lived at Delph House. The exact site of the building is unknown but there are two main possibilities. Firstly, the old joiner's shop which was demolished to make way for the Savings (now Lloyd's) Bank in 1902; secondly, the building now occupied by the Post Office which was Edwin Fairlamb's joiner's shop at the turn of the twentieth century. Nicholas married Mary Adamson on Boxing Day of 1796. The first of a number of joiners in the family, he proved traditional in his choice of children's names; Nicholas, Robert, Thomas, Elizabeth and Ann. By the mid-1850s Llewellyn's father William was postmaster. His and his grandfather's (the first man to be detained in Allendale Gaol) gravestones are standing in the churchyard. The Fairlamb name has Norman origins. The Manor of Farlam, or Farleham (near Brampton), was given by Hubert de Vallibus to one Walter de Windsor, whose descendants took the name of Farlam. The manor passed out of Farlam hands in the fourteenth century. In the reign of Edward III (132777), John de Farlam, having no children, devised the manor to Ranulph de Dacre and Margaret Multon, his wife. Thus the manor of Farlam passed back into the Barony of Gisland. The manor has passed ever since with the barony and is now held by the Earl of Carlisle. Family folklore that the Fairlambs came originally from Cumberland thus holds true. Although the actual link is yet to be uncovered, the movement of Farlams into Northumberland generally occurred in the sixteenth and seventeenth centuries. It is likely, therefore, that Nicholas Farlam of High Oustely in Allendale (b.1635) was not many generations removed from the Cumberland Farlams. Farlam Hall was rebuilt in the eighteenth century, and last extended in 1860. In 1975 it was restored and converted into a hotel. Farlam manor is bounded on the north by Brampton and Denton, on the east by Midgeholme, on the south by Hayton, and on the west by Brampton. It comprises the townships of East and West Farlam and Midgeholme, the last of which is now annexed to the recently created parish of Midgeholme. East Farlam township contains a village of its own name, and the hamlets of Kirkhouse and Hallbank Gate. West Farlam contains the village of Milton, one and one half miles from Brampton. Might the Fairlambs be descended from the Saxon Kings of England, the Scottish Kings and the Dukes of Normandy? Not as unlikely as it seems. Walter de Windsor, the first Farlam (see above) was descended from a William de Windsor. William de Windsor's mother was Edyth Plantagenet (b.1162), niece of King Henry II (11541189), great-granddaughter of Henry I (11001135) and great-great-granddaughter of William The Conqueror (10661087). Through Henry I, Edyth Plantagenet's grandfather, the paternal line extends through William The Conqueror to the Norman dukes. The line can also be traced through Henry I's mother, Matilda (Edith) of Canmore to Edward The Confessor and the Saxon Kings. Matilda of Canmore's father was Malcolm III of Scotland, whilst Edward the Confessor was her great-granduncle. The Saxon line thus extends back to the first recognised King of England, Alfred the Great (871899). 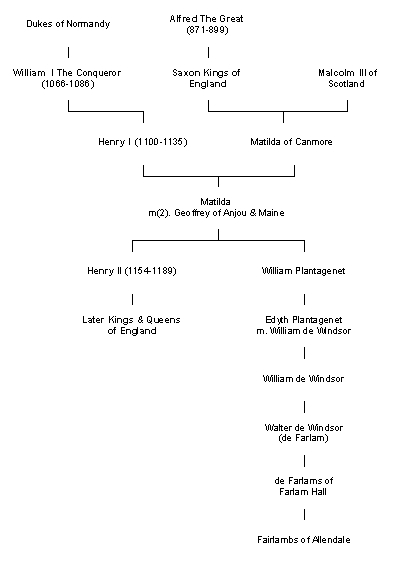 It is highly unlikely a direct and unbroken line from Nicholas Farlam can be constructed (due to lack of data), but it can be shown (open this chart) how the the branch of the de Windsors were descended from the English Crown.